Send them the taste of a favorite neighborhood deli. 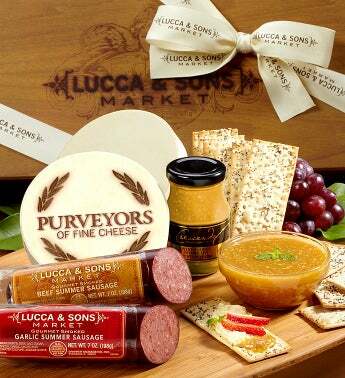 Inside this Lucca & Sons Market™ Sausage & Cheese Gift, they’ll find a savory selection of hearty, USDA-quality, gourmet smoked garlic and beef summer sausages paired with a mild, spreadable parmesan herb flavored cheese. Also included are an appetizing gourmet mustard dip—Sweet & Spicy—and wholesome flatbread. Delicious snack combinations are infinite—so go for it! Send them the tastes of a favorite neighborhood deli in this Lucca & Sons Market™ Deluxe Meat & Cheese Gift. It's a savory selection of hearty, USDA-quality, gourmet smoked garlic and beef summer sausages paired with a mild, spreadable parmesan herb cheese. Also included are an appetizing gourmet mustard dip—Sweet & Spicy—and wholesome flatbread. Delicious snack combinations are infinite—so go for it!